Fresh lemon fragrance. Provides effective sanitising action. Independently tested to BS6471 QAP50. Eliminates unpleasant smells at source. Prevents hard water scale accumulation. For the regular cleaning and sanitising of all ceramic, stainless steel, painted and other non-porous surfaces. 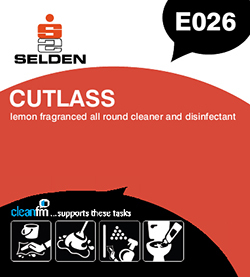 Recommended in bathrooms, shower rooms and for general housekeeping applications. To clean and sanitise all hard surfaces dilute 1 part to 80 parts hot water. For sanitising soak for 10 minutes in a solution of 1 part to 40 parts hand hot water. Composition An aqueous blend of mild acids, biocides and cleaners incorporating a fresh perfume.